World champions South Africa completed yet another big win at Centurion – this time by an innings and 18 runs – to complete a 3-0 whitewash of Pakistan, and in the process finishing a superb home Test summer, a season where they won all five Tests to further widen the gap between themselves and the rest of the pack – they are now a good 10 points clear of second-placed England. Also, Greame Smith’s men have put to rest all doubts of them not winning as regularly at home as they have been overseas. Arguably, South Africa’s biggest strength is its awesome array of fast bowlers We have indeed not come across such such a complete fast bowling unit in recent times. Even when the first-choice fast bowlers are out due to injury, someone or the other cashes on the rare opportunity provided. This can be aptly justified by Kyle Abbott’s breathtaking debut at Centurion, where he ended up with match figures of 9/68, including 7/29 in his very first innings. Last season, Marchant de Lange had made a similar start when he took 7/81 on debut against Sri Lanka at Durban. Rory Kleinveldt has also improved since his mediocre debut at Brisbane. Dale Steyn, the world’s best bowler, has meanwhile overtaken Allan Donald to become the third highest wicket-taker for South Africa, and it is just a matter of time before he becomes the highest, given is superb strike rate in Test cricket. Vernon Philander shows no signs of slowing down his wicket-taking rate, while the tall Morne Morkel and the ever-dependable Jacques Kallis provide ideal foil. Clearly, this problem of plenty has been one of the major reasons of South Africa’s utter dominance of late. Another factor in South Africa’s success has been their new-found never-say-die spirit. This was underlined at Cape Town in the second Test against Pakistan. The visitors were right on top with Saeed Ajmal in his element, but South Africa overturned the situation courtesy an unexpected knock of 84 from Robin Peterson. Quite often sidelined in the bowling attack due to the success of the pace bowlers, Peterson played the most important innings of his Test career and showed that he is indeed a vital cog of the side. Again in the second innings when Pakistan were settling well, he combined with Philander to wreck the middle order and eventually set up a series-clinching victory which seemed highly unlikely at one point. This spirit was shown most amazingly by Faf du Plessis during the tour of Australia, when he scored 110 of the most valuable runs on debut at Adelaide to script one of the greatest escapes ever seen. 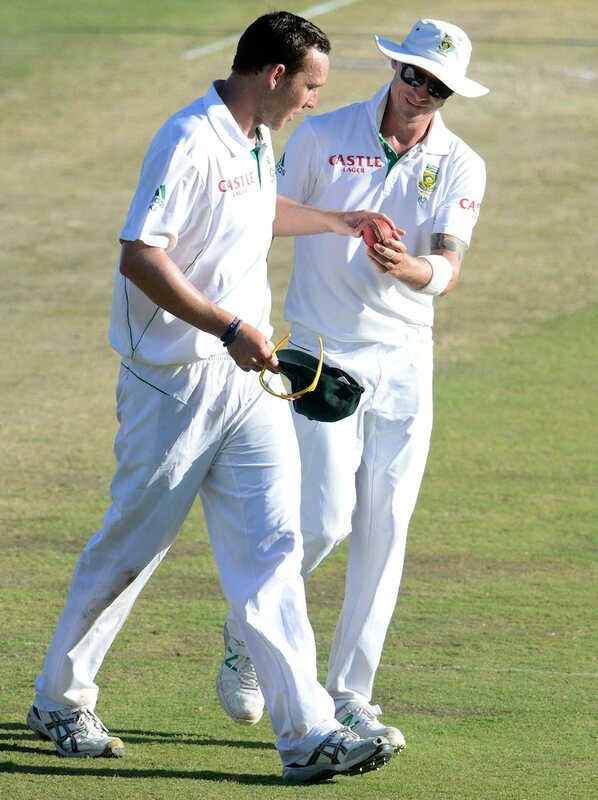 A buoyed South Africa went on to win by 309 runs at Perth, and with it the series. Also, with that high quality innings, du Plessis continued the trend of sensational South African debuts starting with Philander, de Lange and now continuing with Abbott; thus proving the side’s bench power. A point of view says that South Africa’s ascendance to the top has been facilitated by victories in conducive conditions, and that they are yet to be tested in the sub-continent. However, the conditions at Cape Town against Pakistan were no less different, and South Africa proved that they have it in them to counter the best of spinners on turning tracks. Things might have been different had Pakistan opted for Abdur Rehman to partner Ajmal in the game, but then one cannot rely on ifs and buts; in the end South Africa deserved to win after their fightback. Also, if England and New Zealand were able to achieve favourable results in India and Sri Lanka respectively a few months back, there is absolutely no reason why South Africa cannot succeed in the sub-continent – Steyn and Philander have proved their ability with the old ball, and Peterson is developing into an effective bowler. Plus their batting line-up is the best in the world as well. This achievement of South Africa needs to be celebrated and appreciated, and is arguably their highest point since readmission more than two decades back. Looking at this team and its camaraderie, it does seem that the days of the shameful apartheid and the dismal match fixing saga are a distant past. Many critics may like to say that South Africa continue to ‘choke’ in ICC limited-overs tournaments, but then they are taking Test cricket seriously right? And undoubtedly, unless a team is worthy of being a good Test team, limited-overs successes do not matter much. South Africa are not just worthy, they are fast setting a benchmark which will be very difficult for other teams to reach in the near future.